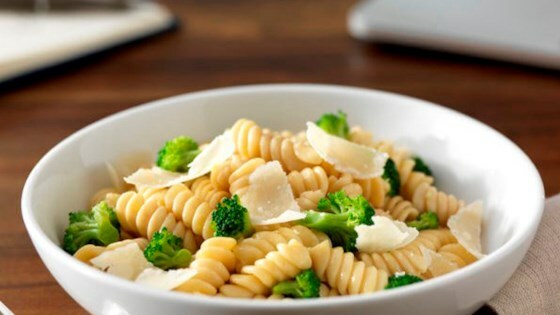 "Get dinner on the table in five minutes with this quick and easy Ready Pasta rotini featuring broccoli and a sprinkle of Parmigiano-Reggiano." Place thawed broccoli in a bowl with oil, salt, and pepper and cook in the microwave for two minutes. Tear corner of Ready Pasta pouch to vent. Heat in the microwave for one minute.